For years I have thought I might suffer from False Memory Syndrome about Golden Bantam or Golden Cross Bantam sweet corn (aka "corn on the cob," or "roasting ears"). 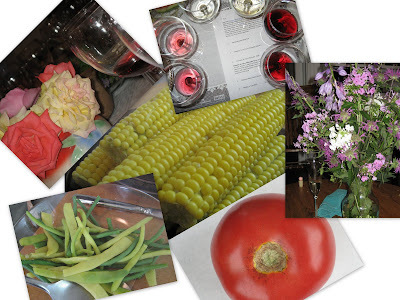 Since our urban garden had no space for corn, and no growers offered it at a nearby farmers' market, I thought maybe I just imagined that wonderful corn-y taste, not overwhelmed with the taste of fake-y sugars. I have never liked the super-sweet corn varieties, none of them, though I have tried. Our family corn-on-the-cob consumption has been sadly limited to a few happy meals with family members and the few weeks we spend in Massachusetts each summer, enjoying a local farm's Butter and Sugar ears, picked daily. Butter and Sugar, a New England favorite, is a beautiful blend of corniness and sweetness. Recently Fine Cooking listed it as "sweet," the least sweet of four corn categories. I am digressing. Here is the point of this post: I come to praise Golden Cross Bantam Sweet Corn. The Gardener grew a 10 X 10 patch in our nearby community garden this year. We have had 12 ears so far, and counting. In fact, I like this corn so much, I'm virtually counting the kernels. The taste is wondrous - corn, perfectly (but not excessively) sweet. Yes, just like I remember, I can report with much joy. Corns like Golden Bantam may not work for farmers' markets. These are heirloom corns with little forgiveness. Picked too young, they lack flavor. Allowed to age past their prime, their sweetness turns to starch and the texture becomes sticky. The reason to put up with this level of pickiness - the wonder of the flavor of the corn on the one or two days when it is at perfect maturity, and is cooked as soon as it leaves the field. I knew none of this variety's history, other than how it intersected with my own personal history, until I read two Victory Seed Company vignettes, below. Golden Bantam, Improved (Golden Bantam 12 Row) 85 days, Although to some the small ear size of 'Golden Bantam' is a desirable trait, others like larger ears. This variety is an improved version of the old standard yellow sweet corn. Instead of eight rows, this variety has ten to fourteen rows and the ears are slightly longer. It was improved to stay tender longer. Golden Bantam78 days " The old standard yellow sweet corn that has been the home gardener's favorite since the beginning of the 20th century. A farmer named William Chambers of Greenfield, Massachusetts had grown this variety for years. After his death, a friend of Chambers found some of the sweet corn seeds and sold them to W. Atlee Burpee. In 1902, Golden Bantam was featured in a Burpee catalog. Before 1900 most people thought that yellow corn was fit only for animal feed. Within a few years, people in the United States began to favor yellow corn.